I travelled through Shanxi Province in China recently, kicking off in Beijing and continuing through Taiyuan, Pingyao, Datong and back to Beijing with assorted excursions in particular to the amazing Buddhist caves at Yungang just outside Datong. 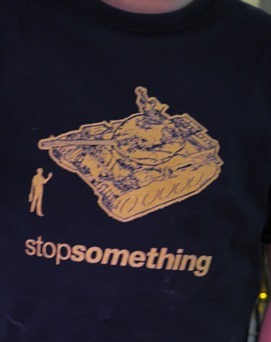 ◄ So I was a little surprised when I was in Beijing to spot this T-shirt. A little risky I would have thought, but the gentleman wearing it was quite relaxed about the banned image on his chest.